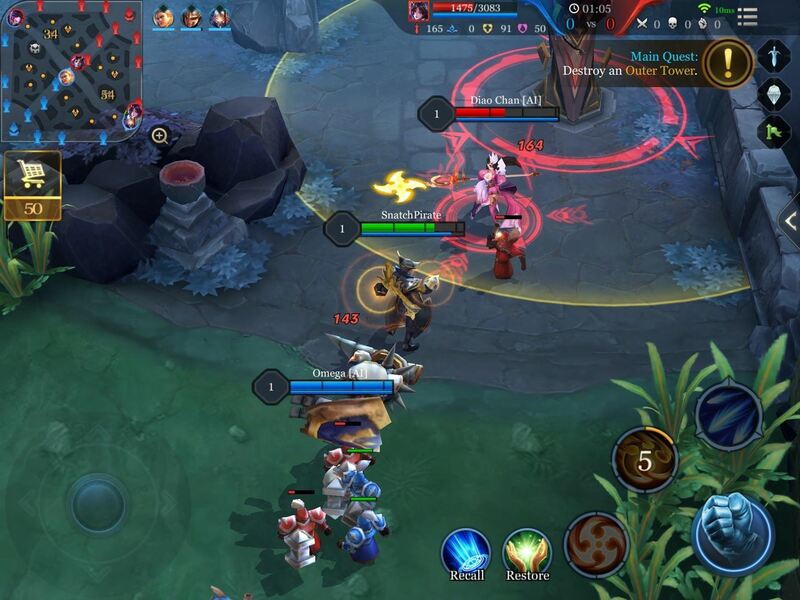 You may have heard of Honor of Kings, the multiplayer online battle arena game so popular that it has the potential to do for mobile what League of Legends has done for the PC in the world of competitive online gaming, but you'll soon hear about its western iteration, Strike of Kings. Tencent, the China-based online gaming giant now looks to expand to the lucrative western market and has released the game to many parts of Europe as a soft launch for iOS devices. Gameplay in Strike of Kings is very similar to Tencent's League of Legends, albeit with more simplified bases and shorter battle times to suit the on-the-go nature of mobile gaming. The multiplayer battles remain intact, along with the option of slaying neutral monsters to obtain special buffs and give players that extra edge. Leveling up and obtaining precious loot is essential, and Strike of Kings even lets you equip stronger weapons to use on the battlefield. Tencent and DC Comics have even partnered up to let legendary superheroes like Batman join the fun. As of now, Strike of Kings remains out of reach for users here in the US due to region restrictions imposed by Tencent. There are ways around this, of course, so if you'd like to stay ahead of the curve gaming-wise and give Strike of Kings a shot before it lands stateside, continue reading to find out how. To install and play Strike of Kings, your iPad, iPhone, or iPod touch will need to be running iOS 7 or higher. In addition to that, the App Store's region restrictions will need to be bypassed before you can download the game in the US. In order to do this, create an Apple ID using a realistic home address from one of the European countries where the game has been released — we recommend the Netherlands. Once you have a Dutch Apple ID complete with a realistic home address, just sign in with this account on your iPhone and you'll automatically be transferred to the Netherlands-based App Store. If you'd like a more detailed guide on the process of spoofing locations in the App Store, just head to the following link. After everything's been set up, you'll be free to download and install Strike of Kings just like you would any other app or game. Simply do a search for the game in the App Store, or just head to the following link to download it. Remember that Strike Of Kings is still just a soft-launched game, meaning it may need further tweaking before its full release. So you might experience some minor issues while playing, but in our testing, the game ran perfectly fine on an iPad Pro running iOS 10.3, and an iPad Mini 1st generation on iOS 9.3.5. Let us know your thoughts about Strike of Kings and post your comments and tips down below. You need to correct this article. This game has nothing to do with Riot or League of Legends. Tencent, the Chinese game company, bought majority share of Riot, so in that sense, yes, they now own Riot and all its intellectual property. However, if you do your research, you will see that this game has nothing to do with Riot nor did Riot help make this game. This game was in development even before Riot was acquired. This game is nothing but an inferior Chinese copycat product for mobile. Unfortunately, there are no reliable .ipa files I can share with confidence. I'll upload one as soon as I find. In the meantime, did you follow the instructions on creating an account found here: https://ios.gadgethacks.com/how-to/change-your-app-store-country-download-region-locked-apps-games-your-iphone-0176591/? If so, what type of errors are you getting? Thanks!